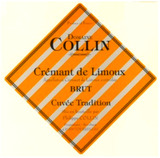 This is a balanced, elegant, Cremant de Limoux, with no rough edges. The Chardonnay gives the wine brightness and a lively acidity, the Chenin Blanc adds richness and texture, while the Pinot Noir adds depth to the wine. Given that this is Collin's entry level sparkling wine, this is an impressively balanced and complex wine. It is truly a testament to what this relatively obscure vineyard area is capable of producing.